James Ward’s is a classic example of how WebJars project JFrog Bintray can be used to scale up a manual procedure into an automated, on-demand, deployment process that’s distributed and available within the community. Realizing that his manual efforts to deploy WebJars during his free time were unrealistic to maintain in the long run, using Bintray’s extensive REST API, Ward developed an automated way for contributors to make WebJars available to the community on demand using JCenter, Bintray’s public Maven repository. With over 8 million downloads, using WebJars is now an extremely popular way for web developers to resolve and build their software. How did WebJars initially get deployed? Each WebJar had a project containing a POM file, with the Maven build definition, describing all the required metadata and configuration. Running a Maven build on a WebJar pulled the source code for that web library from its source, packaged it into the jar file and deployed it on Maven Central. JFrog Bintray met all of the WebJar project specifications, including deployment to JCenter (with automatic sync to Maven Central), on-demand availability, compatibility with NPM and Bower repositories, and automated metadata inclusion. Bintray was the ideal choice as the means for automating the scaling of WebJars. In addition to meeting all of the above prerequisites, Bintray natively supports all major package formats, which allows seamless work with industry-standard development, build, and deployment tools. Moreover, preserves many REST API norms which Bintray’s API facilitate learning, use, and the complexities of dealing with licenses. To do all this I used the Bintray API, which is actually a really fantastic API. It really preserves all of the norms of REST API’s. It was really easy to learn and use. The REST APIs here are really straight forward, just standard REST using the HTTP verbs to do the things you would expect. Super easy! Bintray’s optimal management console allows users to view all deployed packages, with their associated files, versions and status. Additional metadata, such as the source code location and licenses, is also included. Bintray also provides an easy to use interface for users to manage their artifact versions. This is especially useful when a deployment fails and a re-sync is needed. Bintray exceeded the basic needs of an automated system due to its wide support of package formats, APIs, and management console. It now only takes a minute for the automatic scaling deployment process, enabled by Bintray, requiring only the version, group ID and artifact ID to be specified. After which the WebJar is readily available in the library for a Java build. Within a year, the Bintray solution has successfully resulted in thousands of on-demand deployments that continue to grow. After volunteering over 460 hours of his time to manually deploy WebJars, James Ward realized that his continued commitment was better spent on developing an on-demand automation process. 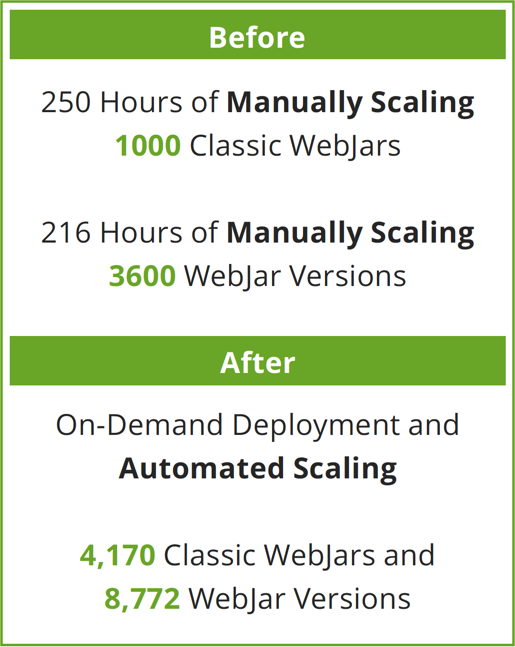 With JFrog Bintray, the project’s requirements were easily met, and Ward was able to scale his WebJars project to allow the community to deploy WebJars on demand. This case study shows the value of Bintray APIs to facilitate automation in an OSS project. Enterprise Bintray users get even more powerful functionalities with the API, including automated handling of access control through access keys and entitlements, detailed stats, detailed logs, dynamic downloads, private repositories, unlimited API queries, and more.